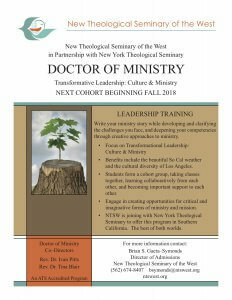 Financial assistance for the 2nd and 3rd years can be applied through New York Theological Seminary. Our unique partnership is one that students begin their studies in Year 1 with New Theological Seminary of the West (NTSW), and then we transfer the student to New York Theological Seminary (NYTS) for Years 2 and 3. Most, if not all, coursework will be completed in Southern California through NTSW, however your diploma will have both seminary names printed on the front. This design allows the student to benefit from both institutions while conveniently remaining on either coast and mitigating increased financial dependence.